The UN Climate Summit 2014 in New York last week passed, as expected, with public statements of intent but no sign of firm commitments to reducing climate emissions. If a deal is to be reached in Paris next year, at the latest “last hope” climate summit, expectations for progress are pinned on prospects of an initial agreement between the world’s two largest emitters: China and the US. In the past, this has led to a break-down in progress. Most famously, at the UN climate talks in Copenhagen, China and India protested against what they saw as a failure to reduce emissions by developed countries, and an attempt to restrict their own economic growth and development. Five years on, China is far more willing to accept its common, but differentiated, responsibility, says Professor Huan Qingzhi, a leading scholar working at Peking University's Centre for Environmental Politics Research. Speaking to chinadialogue, Huan said China was “not ready to be a world-leader on climate governance and still sees developed countries like the US as having a bigger responsibility to lead. However, he added that China “is becoming a more active player” in global climate politics and “is ready to take on more responsibility – you will certainly see a better offer than China came up with at Copenhagen. The key mover for China remains the US, added Huan, pointing to the rapid response to Obama’s announcement on cutting emissions from coal-burning power plants and China’s own talk of including emission targets in its next Five Year Plan (2016-20). Speaking after the UN summit in New York, Greenpeace climate campaigner Li Shuo said environmental concerns were higher up the agenda in China today. “Five years after Copenhagen, China is in a vastly different position. Domestic air pollution is forcing the country to embark on a new path away from coal, and 2014 saw the lowest coal consumption growth in a decade,” he said. 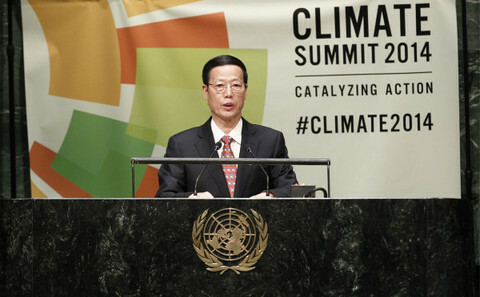 However, Huan said climate negotiators and observers still needed to take into account the slow pace of change in China.